Learning how to surf is a great way to build confidence for anyone. Catching your first wave on your own is truly a memorable experience. 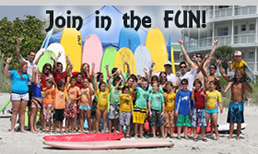 Join Nex Generation Surfing School for our Annual Summer Surf Camp! 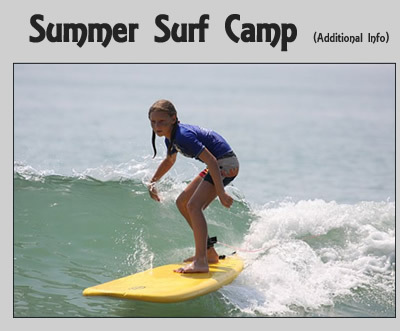 Surf camps run May 23rd to August 12th. Our summer camps are located in Cocoa Beach, Florida, where we have been teaching camps for over 15 years! 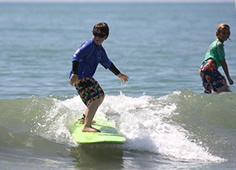 We specialize in all ages and all levels of surfing from beginner to advanced. Each surf camp is an exciting fun-filled week of learning how to surf, improving your water safety skills and meeting new friends! It doesn't matter whether you are just beginning or have some experience under your belt, you will have a great time at our camps and are guaranteed to catch plenty of wave! All ages are welcome! In the past the ages have ranged from 4 to as old as 65. Our staff of professional surfing instructors is ready to take you to the Next level in your surfing! We start with orientation for all the instructors and students to get off on the right track and get to know each other. After that we make sure everyone has sunscreen on and gets properly warmed up and stretched out for the days activities. Once you are ready, we move into the basics of handling your surfboard and paddling it around in the surf. From there we move right into the best part - catching some waves! At NexGen's Surf Camp, your safety is our first priority. If there is inclement weather at any time, we have nearby facilities prepared off the beach so that we can avoid exposure to Florida's afternoon thunderstorms. Don't worry, there is still plenty we have planned. We have discussions about surfing etiquette, how waves are made, other places to surf and how to pick out the proper board for your skill level. We also get further in depth with out coastal marine awareness discussions as you learn how to care for and conserve the beaches fragile ecology. All of our instructors are experienced surfers and the staff always includes CPR certified individuals who are ready to respond to any situation. Our instructors are here to show you the way to enjoy yourself in the sun and learn a respect for the ocean. Make sure your first surf session is a positive one, come to our summer camp and learn how! Bring a towel, something to drink, a comfortable bathing suit and plenty of sunscreen. We have made arrangements to have plenty of sunscreen on hand in case you forget. At Nex Generation Surfing School, we take the health and safety of our campers into consideration and will always make sure that everyone is protected. You can bring your own board if you want to learn on something and keep it with you. However, we do provide all our campers safe soft surfboards to use during our lessons and camps.